One of the basic principles for making good progress on the bilingual journey is the idea of nurturing a positive attitude toward the minority language. This may sound like a mushy sort of aim that can’t really be addressed in ways beyond getting our children to feel that their ability in the minority language is useful to their lives and helpful to the lives of others. But, in fact, there are some very concrete things that you can do to help foster a positive attitude in your bilingual child and fortify his or her love for the minority language. And make no mistake, the more positively your child feels toward the target language, the less resistance you’ll likely encounter and the more solidly you’ll advance on the long road ahead. In this post I focus on eight ways that make playful use of the language itself in order to provide the child with fun and engaging experiences that not only can generate greater exposure to the minority language, they can also nurture the positive attitude we seek. 1. Say “dumb things” in the target language. I’ve discussed this tactic in detail—in the popular posts Why Saying a Lot of Dumb Things to Your Bilingual Kids Is So Valuable to Their Language Development and Meeting the King’s Family and Enriching My Bilingual Children’s Language Exposure—but, essentially, the idea is to engage your children in playful “imaginary talk” on an ongoing basis. Children find such conversations very appealing because they connect directly to the child’s keen sense of whimsy and play. After many years of actively pursuing “imaginary talk” as a teacher and parent, I would argue that the mindful habit of saying “dumb things” is actually one of the smartest strategies for generating language exposure, nurturing a positive attitude toward the target language, and creating a close, loving bond. The other day my 10-year-old son and I were at the train station in Hiroshima when suddenly he was pulling on my sleeve in excitement. ME: That isn’t the goalie. ME: It’s just someone that looks like him. ME: How can that be him? He isn’t even wearing soccer gloves! Real goalies wear soccer gloves! ME: Doesn’t need gloves? And where’s his uniform? If that guy was a real goalie, he’d have a uniform, right? Just give me a soccer ball and I’ll prove it to you. I’ll kick it right past him with my amazing bicycle kick! ROY: You can’t do a bicycle kick! And anyway, this is the train station! ME: I know that! And that’s another reason why he can’t be the goalie! The real goalie is at the stadium right now, my friend, practicing in his uniform and soccer gloves! Dumb, right? But that’s the point, really. (And again, I would encourage you to see my previous posts on this subject for further examples.) The ironic significance of “imaginary talk” is that the silly nature of such interaction is, in fact, enormously engaging and productive, in all the important ways I’ve mentioned. 2. Play word games in the target language. In this case, I’m referring to board games, card games, and apps that focus on language-related activities. Of course, I realize that more games like this can be found in some languages than in others, but it’s also true that more effort to locate such games in your target language—or perhaps adapt games produced in other languages for your own use—will likely yield new possibilities. For much more on word games, with suggested products in English and some other languages, see Recommended Resources: Word Games in the Minority Language. 3. Engage your children in word games orally. Along with physical word games or apps, you can fuel input and interest by making use of spoken games, too. 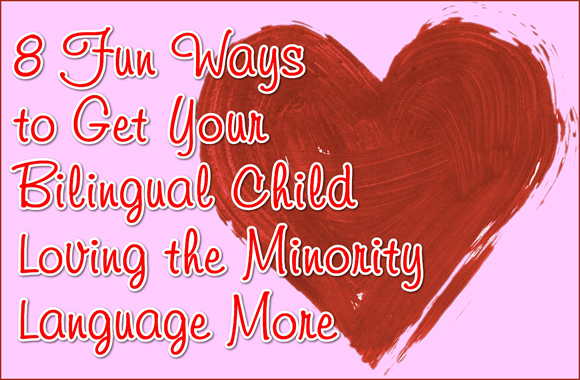 In 18 Ways to Get Bilingual Kids Using the Minority Language More in Your Car, I offer a variety of ideas for playful language activities that can generally be adapted for any target language and used virtually anywhere (not just in the car). Add these ideas to your toolbox—as well as others you’ll find on the web and in books—and give them a go with your kids, adjusting them, as appropriate, for their age and language level. 4. Do crossword puzzles, word searches, and other puzzle-like activities. If English is your target language, and your children are a bit older and have higher-level ability, I highly recommend Easy ESL Crossword Puzzles by Chris Gunn. The title, actually, is a misnomer because these puzzles aren’t really “easy.” In fact, I suspect the book was produced for teens and adults learning English, but it’s actually an excellent resource for younger ages, too, assuming they have a solid foundation in the language. And remember, a crossword puzzle that seems a bit difficult for your child can always be made easier and more effective by inserting full words that are unfamiliar or providing certain letters to aid in guessing the words or spelling them correctly. Did you know that I created “The Ultimate Crossword Puzzle About Raising Bilingual Kids”? Get it here and give it a try! 5. Have fun with “silly stories”. Another paper-based activity, this is quite honestly the funniest activity I’ve ever discovered for children and teens and I think it can be adapted for almost any language. I turn to this tactic frequently, with both my students and my kids, and it’s lovely to hear their laughter—whole classrooms have exploded in giggling delight!—and I’m really pleased that the activity not only stretches their language and literacy ability, it deepens their positive feelings for the language itself. I explain the activity fully—and even offer ready-to-use stories in English—in the post The Funniest Activity I’ve Ever Done with My Bilingual Kids and Students. 6. Tell riddles and jokes. Riddles and jokes are a part of every language and every young child seems to enjoy them once he or she reaches a certain age and level of language ability. Riddles can be particularly effective for generating engagement because, of course, they stir curiosity and make the listener eager to hear the answer. I have a number of inexpensive riddle and joke books and my kids and I have regularly quizzed each other, taking advantage of the “cracks” of time in our day, such as the short time between their bath and bedtime. In addition, I’ve found that riddles are very useful as captive reading material. Along with printed books, riddles and jokes for kids are widely available online, and likely in your target language, too. Tongue twisters are another playful language resource that children find very engaging and fun. Tongue twisters have been created—or can be created—in every language and you’ll find good collections online, including at the 1st International Collection of Tongue Twisters. Palindromes—where a word or sentence can be read exactly the same way, forwards or backwards, are one of the undersung miracles of language. As a boy, I recall marveling at these special words and sentences, and when I’ve shared them with my kids and students, they find them just as appealing as I did long ago. Here are a few examples of palindromes in English. (Try reading them both forwards and backwards.) Can you find some palindromes in your target language? By mindfully making use of these playful approaches to language, on a regular basis, we not only engage our children in greater amounts of more effective language exposure, we fuel their positive attitude toward the target language, too. And more love for that language, from early childhood, will ultimately produce a more successful, more joyful bilingual journey. How about you? What additional efforts could you make to help strengthen your children’s love for the minority language? Previous post: Raising Bilingual or Multilingual Kids? Don’t Miss These Helpful Resources!